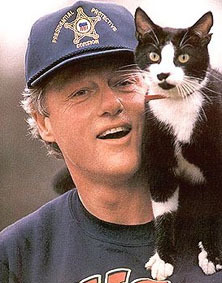 Word tonight that Socks Clinton, the one-time Arkansas stray adopted by the Clintons who rose to international prominence and literary fame as sole feline inhabitant of the White House, died today….Upon leaving the executive residence in Washington, the Clinton family gave the cat to the president’s secretary, Betty Currie, who had recently lost her own pet. ….Though reticent in public, Socks was known as an affectionate creature, even tolerating the First Dog, a brown Labrador named Buddy, who was killed in a 2002 collision with a car near the Clintons’ suburban New York home. ….Some foreign leaders were said to have even requested to have their photo taken with the First Kitty, which he tolerated because he favored diplomacy over militancy. At the end Socks was reported unwilling to eat and unable to stand. He had a last walk outdoors Thursday in Currie’s arms. This has been a bad year for presidential cats. Rest in peace, Socks.